Porphyrins, phthalocyanines and their numerous analogues and derivatives are materials of tremendous importance in chemistry, materials science, physics, biology and medicine. They are the red color in blood (heme) and the green in leaves (chlorophyll); they are also excellent ligands that can coordinate with almost every metal in the Periodic Table. Grounded in natural systems, porphyrins are incredibly versatile and can be modified in many ways; each new modification yields derivatives, demonstrating new chemistry, physics and biology, with a vast array of medicinal and technical applications. As porphyrins are currently employed as platforms for study of theoretical principles and applications in a wide variety of fields, the Handbook of Porphyrin Science represents a timely ongoing series dealing in detail with the synthesis, chemistry, physicochemical and medical properties and applications of polypyrrole macrocycles. Professors Karl Kadish, Kevin Smith and Roger Guilard are internationally recognized experts in the research field of porphyrins, each having his own separate area of expertise in the field. Between them, they have published over 1500 peer-reviewed papers and edited more than three dozen books on diverse topics of porphyrins and phthalocyanines. In assembling the new volumes of this unique Handbook, they have selected and attracted the very best scientists in each sub-discipline as contributing authors. This Handbook will prove to be a modern authoritative treatise on the subject as it is a collection of up-to-date works by world-renowned experts in the field. 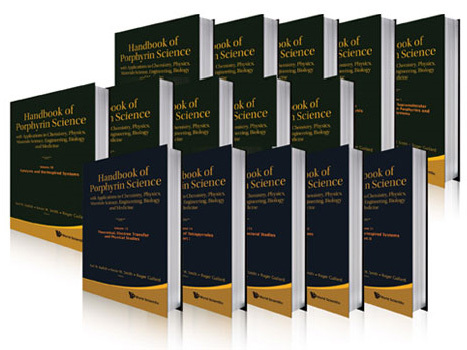 Complete with hundreds of figures, tables and structural formulas, and thousands of literature citations, all researchers and graduate students in this field will find the Handbook of Porphyrin Science an essential, major reference source for many years to come.